This morning I had a wonderful and extra long pone call with my best friend. This is an every day event for us, talking on the phone before work, but today it was even better because we had two full hours to ourselves. There was an accident on her way to work. Still waiting on word about the driver of the truck, but we have not heard any other injuries so good thoughts and prayers for all involved. During this talk she kept bursting out in little fits of laughter. About a mile from the accident and thick in the traffic for well over an hour she saw a city truck in front of her with one of those digital signs on the top of it. The message it was displaying was, “Accident ahead.” For those that were a little slow on the pick up. Another incident that brought laughter was the man behind her who honked and was quite noticeably irritated. The reason for this one was they had just come up to a sign indicating that the two lanes were going to converge into one. Not one single car in front of her was letting anyone in, neither was the guy behind her. So she slowed down to let about six cars in the line before her. The guy behind her was infuriated. He finally pulled out and went around her – only to cut in front of someone up ahead. As we enjoyed our long talk catching up on our Sundays and talking about plans for today, this week and this and that we both made the observation how easily this snafu was for her. It was because of her attitude. She could have easily been irritated or upset about the traffic jam but that would not make it speed up or go any faster. Instead, she saw it as a little blessing – a time to catch up with her best friend, relax and just enjoy the time. My best friend is awesome. 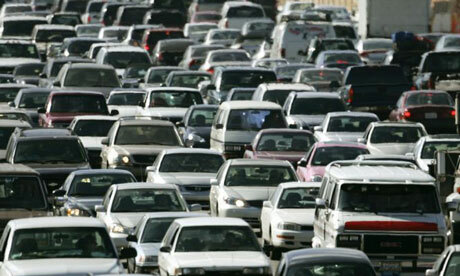 That is when it dawned on me that job searching is a lot like being stuck in a traffic jam. Sometimes you are just going to be stuck in the system somewhere: not sure what is going on in front of you and unable to turn around and go back. You are forced to just sit there, inching along, completely helpless but without any recourse. The traffic will clear, all will be ok and you will reach your destination but this is a opportunity. You have the choice of being upset, frustrated and taking it out on all the people around you that have nothing to do with the situation. Or you can take it as a forced moment of pause. You can take the time to reach out to someone, take time for yourself or just simply reflect on what you want to do when you get to your destination. It is all about your attitude. We all get stuck in the jam, but some of us come out better in the end because we choose to. Do You Relate or Simply Respond?